This two-hour trip takes guests on a one-of-a-kind journey through the history, culture, and wildlife of the Klamath River. Guides will be sure to point out the incredible animal life that inhabit the area, including bears, osprey, hawks, bald eagles, golden eagles, and elk. New this year, guests can book tickets for this thrilling ride here at the Yurok County Visitor Center. Tickets for Adults cost $45.00, $40.00 for Seniors/Military, $35.00 for teens ages 12-17, $25.00 for children ages 4-11, and children below 4 ride for free! 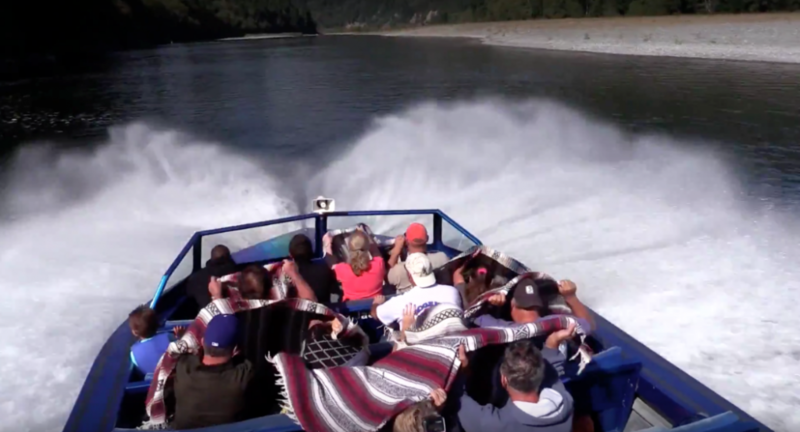 Klamath River Jet Boat Tours goes on three tours a day so you’ll have ample opportunities to sail the river. Oh, and here’s a tip. Be prepared to get wet! Looks pretty fun, doesn’t it? Here’s what fellow visitors had to say about their experience on TripAdvisor. “This 2 hour jet boat trip was wonderful. We have been driving scenic routes and hiking short trails since northern Oregon, and this was a fun, informative, and even sometimes spiritual experience. The captain was smart and funny, and the mate spotted a bald eagle for us. We were a group of 12 (they can take 25). I highly recommend it.” – Lauren J. “We took the 4-6pm tour on 09/09/15 and it was awesome. Due to there being tons of fisherman we didn’t get to see any bears but I was really hoping to see some Bald Eagles and we got to see FOUR! It was a really fun trip, the guide was awesome and it was well worth the cost. I would absolutely recommend this trip for anyone considering it.” – Joshua T.
“10 a.m tour, jet boat captain was knowledgeable and funny, we saw a couple of bald eagles and many other local birds, the ride was very entertaining and the spins added many minutes of excitement. would highly recommend.” – Joe A. “The staff and crew were very friendly and helpful. We first traveled to the estuary where the river meets the Pacific. The fog was thick over the ocean and we enjoyed seeing seals and a variety of sea birds. Then we turned upstream and headed toward blue skies and sunshine. The further up river, the more pristine the natural surroundings. Simply put: it’s GORGEOUS.” – Elizabeth B. As you can see, the tour comes highly recommended! Don’t miss out, come explore Klamath river and all its secrets for yourself!